Rather than operate as a music news source, Electronic Beats operates more as a music information source. We want to share with you; we want you to know what we’re hearing, what’s reverberating our cochleas and sending broader vibrations throughout our bodies, and by extension our audio-addled souls. Down with that? Welcome to Editor’s Choice. This week I read two remarkable things: one was this recent Kanye West interview, the other one was tao lin’s new novell Taipei—both are stuck in this weirdly detached realm, where money or success enable a unique way of ennui and power. And then there was Molly Nilsson’s new song, which as a “power ballad” already takes itself out of this game and, layered upon ’80s-esque chords, celebrates a life on the fringe, without falling for the the usual “hand me down dreams”. The song is taken from Nillson’s upcoming album The Travels, which will be released on June 21st. Catch her live in Berlin next week at Berghain Kantine for the album release party. I guess Mishka is a streetwear brand or something, but the important thing here is that this is a free DJ Sliink mix. So if you like your dance music ruff and ready, this is a hot half hour of New Jersey club and rap. If you like grime, you pretty much need this: two old-school DJs and another veteran. After spending ten years living in the UK, Slimzee is one of my favourite DJs. He’s great in the mix and always plays subtly different strands of grime and lots of tracks I’ve never heard. This DJ party gets messy in spots, but there’s so much of the rude energy that makes grime so great that it just adds to the fun. Indulge me this week as I waver from paths electronic. The Julie Ruin is a project of Kathleen Hanna, feminist activist, musician, late of Le Tigre and Bikini Kill etc. (still don’t know? This way please). “Oh Come On” is the lead single from the forthcoming Julie Ruin debut and, coming a good nine years after Hanna’s last outing with Le Tigre’s This Island, is every bit as snotty, ramped up and vital as you could hope it to be. The PMR imprint is on a roll. After signing such magnificent acts as Disclosure, Jessie Ware and Julio Bashmore, Dornik is the next to be added to their roster. Talent alert! Smoky Folk is an option for hot summer nights here in Berlin. I don’t know anything about Joanne Roberston, but since there’s an album out soon via Hype William’s World Music imprint, I’m pretty sure that her momentum is already building, it’s just a question of time. Read previous editions of Editor’s Choice here. 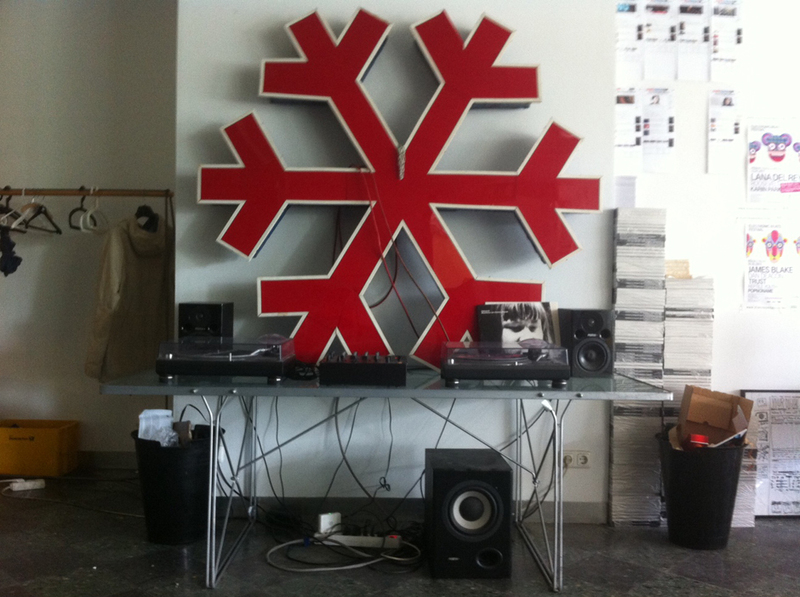 The red star in the image above is the temporarily suspended neon sign of minus design, Berlin.